Dino Bite from the leading independent games company, Drumond Park, is a monster action game designed to provide fearsome, spine-tingling fun! Suitable for children aged 4 years and over, this fun game can be played by two or more players and is guaranteed to keep boys and girls enthralled for hours on end. The aim of the game is straightforward. Each player is tasked with trying to save as many of the 20 helpless baby dinosaurs that are covered by a large green leaf... which in turn is being watched over by the scary T-Rex dinosaur. These poor souls have been stolen from another nest and are trapped here, awaiting their fate. You job is to try and rescue them without being spotted. Players must take it in turns to grab an egg from the nest with the supplied tweezers. (Fingers are fine if you're the youngest player!) 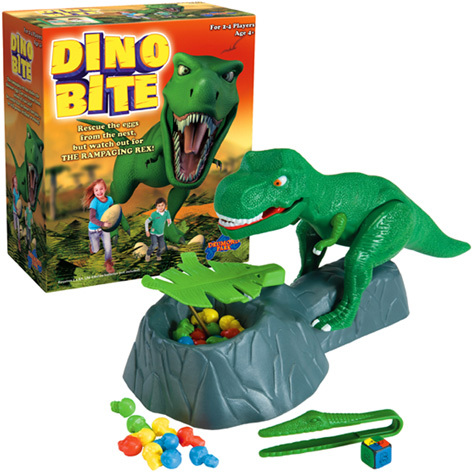 With each roll of the dice, players carefully lift the edge of the leaf, very slowly and steadily move their tweezers into the nest, grasp a baby dinosaur and drag it to reasonable safety! Sounds simple? Well, you probably guessed there was a sting in the tail. The foul-tempered dinosaur went to a lot of effort to capture this bounty and is prepared to guard it fiercely. He knows exactly what you’re after - and when he spots you, he’ll let out a ginormous roar and lunge towards you in a truly terrifying way. When that happens... you're out! Please tell us what you think of Dino Bite by Drumond Park.